...other than Myst, what can I use it for? Ever see the Chun-Li is jealous ones? TF2 part made me laugh. Good YTP. I saw that infomercial, hilarious. There's a rumor that it is compatible with old PC games. I also emailed RadioShack of they happened to have any left just through forgotten inventory. Pic is what they told me. Does anyone actually own one? For some reason I have a craving to own one and display it. A system that did worse on the market then our personal favorite. 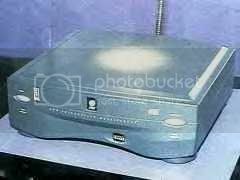 Meet the AT&T model 3DO, it was to come with a built-in phone modem. They were also planning an add-on modem for the other systems. It's like an apple pippin but better. It's a rare jag. I apologize in advance if nobody gets the Team Fortress 2 reference. Was there ever an attempt to bring online support to the 3DO? I know that the Saturn had a module for online, and that console had a short life too. Thanks guys, this is my first time going farther than the Bahamas out of the USA. I wouldn't say eBay is the culprit, it's the sellers. There are some decent sellers, but there are some bad apples out there. Thanks, I can post a link to the site if anyone is interested. I'm not sure, I've never seen any other videos of game play so I have nothing to compare it to. I'll try to upload a video of some gameplay soon. I just found some games on a website for 3DO called: 3DO buffet, and some 3DO interactive samplers. What exactly are they? I fixed it nvm, but the FZ-10 works fine. 3DO came with a Naki controller which I like because there is a switch on the back that lets you use p as a button in sf2. The only thing is the shoulder button sticks, I'm gonna try to fix it. Yeah, but the thing that pisses me off is that he said he shipped it on the 26th of April. Just any controller good for fighting games. Anyone know a good place to find or buy a good (or any condition) joystick for a 3do? I really would like one for super street fighter 2. I've played sports games and then I've played sports. I like sports better. What I say is go outside and play a sport instead of simulating it. Just a quick question, what's Zhadnost's host party about? Looks kinda weird from the cover.